Name the prophet who predicts the birth, death, and resurrection of Jesus. 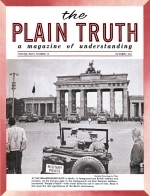 Here is a special first-hand report from our German news correspondent on the editorial staff of the German edition of The PLAIN TRUTH. "Unless there is a way right away, it will be impossible ever to unite our country!" confessed an Ease German refugee whom I interviewed. "A big explosion is inevitable," was a sober comment from another man. A hotel manager, who had just returned from the Berlin scene, put it this way: "Up to now the East German people were able to flee that communist State it they couldn't stand it any longer. Now, with the border sealed off, people will be unable to escape to the West. It's like a kettle with boiling water in it. Before the crisis the lid was off and the steam could escape. With the lid on, however, the steam can't escape - it'll build up pressure and explode." He envisioned the likelihood of an uprising by the people against the East German regime.